The hippocampus is functionally heterogeneous between the dorsal and ventral subfields with left–right asymmetry. To determine the possible location of contextual memory, we performed an inhibitory avoidance task to analyze synaptic plasticity using slice patch-clamp technique. The training bilaterally increased the AMPA/NMDA ratio at dorsal CA3–CA1 synapses, whereas the training did not affect the ratio at ventral CA3–CA1 synapses regardless of the hemisphere. Moreover, sequential recording of miniature excitatory postsynaptic currents and miniature inhibitory postsynaptic currents from the same CA1 neuron clearly showed learning-induced synaptic plasticity. In dorsal CA1 neurons, the training dramatically strengthened both excitatory and inhibitory postsynaptic responses in both hemispheres, whereas the training did not promote the plasticity in either hemisphere in ventral CA1 neurons. Nonstationary fluctuation analysis further revealed that the training bilaterally increased the number of AMPA or GABAA receptor channels at dorsal CA1 synapses, but not at ventral CA1 synapses, suggesting functional heterogeneity of learning-induced receptor mobility. Finally, the performance clearly impaired by the bilateral microinjection of plasticity blockers in dorsal, but not ventral CA1 subfields, suggesting a crucial role for contextual learning. The quantification of synaptic diversity in specified CA1 subfields may help us to diagnose and evaluate cognitive disorders at the information level. Sakimoto Y, Mizuno J, Kida H, Kamiya Y, Ono Y, Mitsushima D. Learning promotes subfield-synaptic diversity in hippocampal CA1. Cerebral Cortex, in press, 2019. 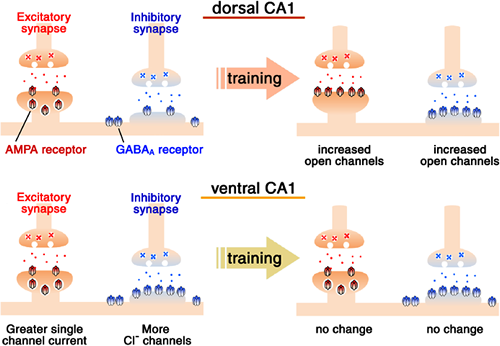 The training bilaterally increased the number of open AMPA or GABAA receptor channels at dorsal but not ventral CA1 synapses, suggesting a functional heterogeneity of learning-induced receptor mobility. Moreover, the single-channel current of AMPA receptor was significantly greater at ventral than dorsal CA1 synapses, and ventral CA1 synapses possessed more GABAA receptor channels than dorsal CA1 synapses. ©2015 PSJ. All rights reserved.